This is an especially fun one because we’re practicing two of my favorite things- styling, and playing around with how we might use the same piece in different rooms. 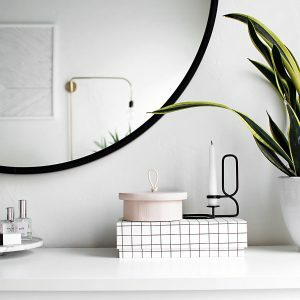 I love the simple effectiveness of changing up spaces just by moving around the furniture or decor, and of course figuring out that some things can serve multiple purposes and uses. 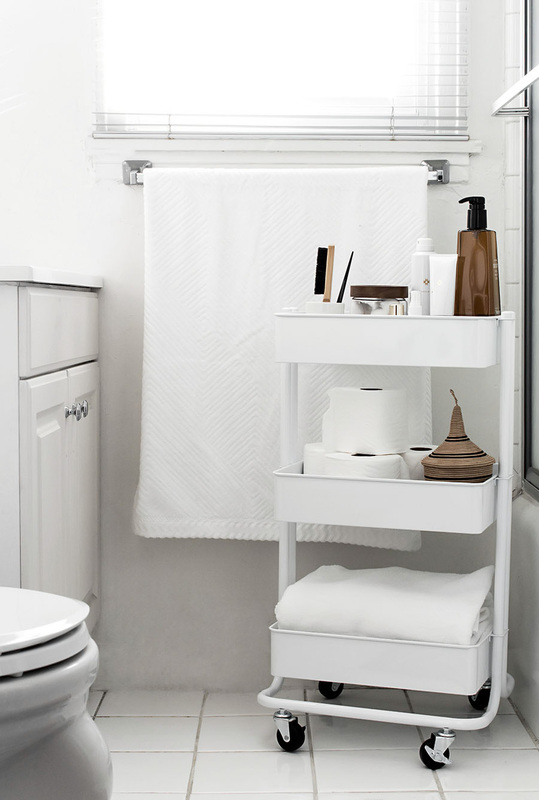 We’re going to do exactly that today with this Lexington Cart from Michaels, who I’m partnering with to share three ways to use a cart in your home! 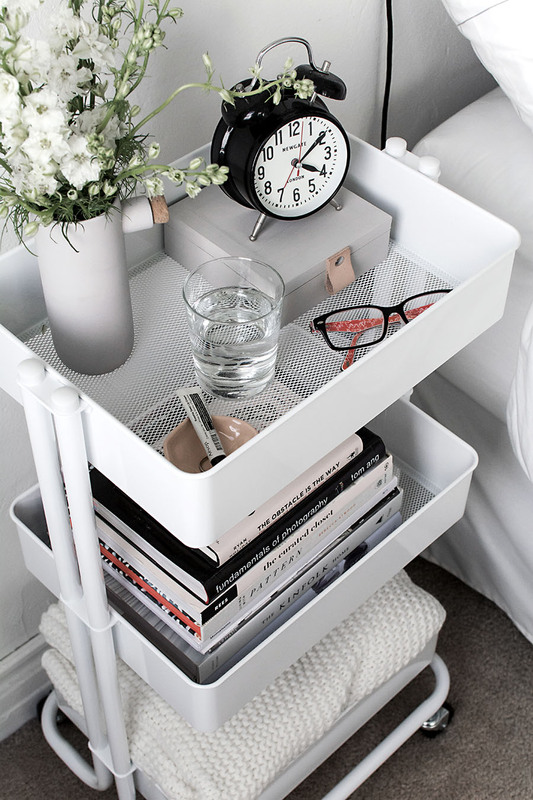 Keep an alarm clock, trinket dishes, your glasses (both kinds), books, throw blankets, flowers, all of it in this cart. Another option is to use it in the bathroom, great for anyone with really limited storage space in this area. 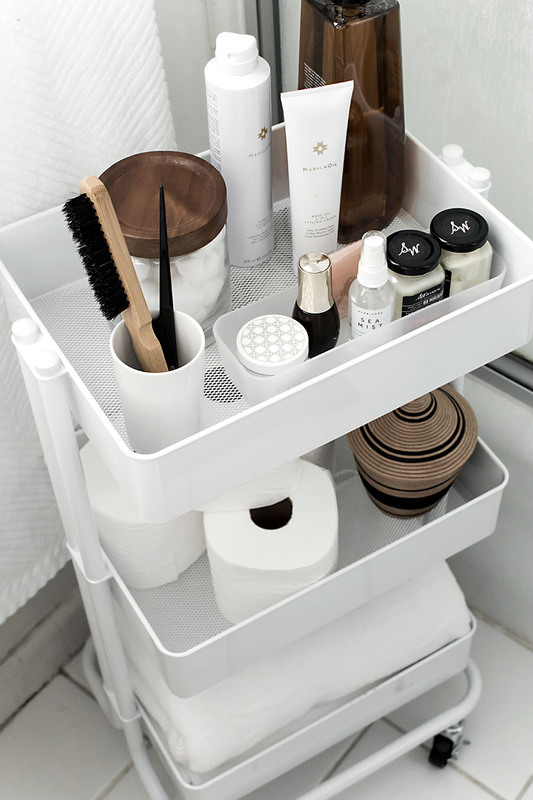 It can be extra storage for toiletries, beauty products, or an external caddy for shower items. On that same train of thought, this could definitely be converted into a vanity cart, specific to organizing your makeup, hair, and beauty items. This was the first idea that came to mind and, sticking to our favorite theme, a very practical one. 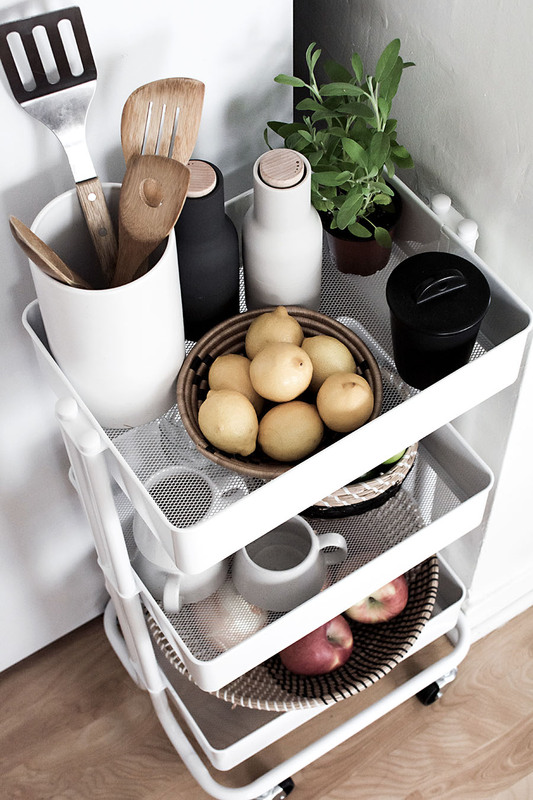 Limited storage is a concern I always like addressing and this cart works well as a mini pantry for produce and snacks, as well as a space for any knick knacks or extra dishes that would otherwise take up precious counter space. The wheels in this case can serve a frequently used purpose. I can see it being useful to cart this around the kitchen and move it around as needed, either while cooking or yup, everyone’s favorite, cleaning. Continuing with the theme of the kitchen, I could see this cart being used as a coffee station or an accessory for at home entertaining, filled with whatever goodies being served for the celebration. I love it way too much when something like this cart packs so much utility while also being cute. It can absolutely go way beyond just these three uses. Which of these uses is your favorite? What would you use it for? PS. Check out what the other Michaels Makers are up to here for this month’s challenge! So cute! Love your styling. I used one of the teal IKEA carts like this to gift my mom a “tea station” last mother’s day (she drinks like 5 cups a day). I styled it with new teacups, tea towels, a jar of biscotti, etc. There are so many good uses for a cart! Oooooo a tea station! I’d love that! So fresh and clean….and pretty! I just love a cart! This is so beautiful Amy! I was surprised when you said this cart is from Michaels! I have the grey one from Ikea and love it! It’s so handy and looks beautiful. I looooooooove the grey color. Would be hard for me to choose against white though I think! I hear ya on the limited space. 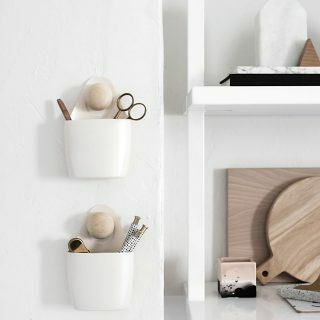 Even better when the small space solution can be cute, agreed! 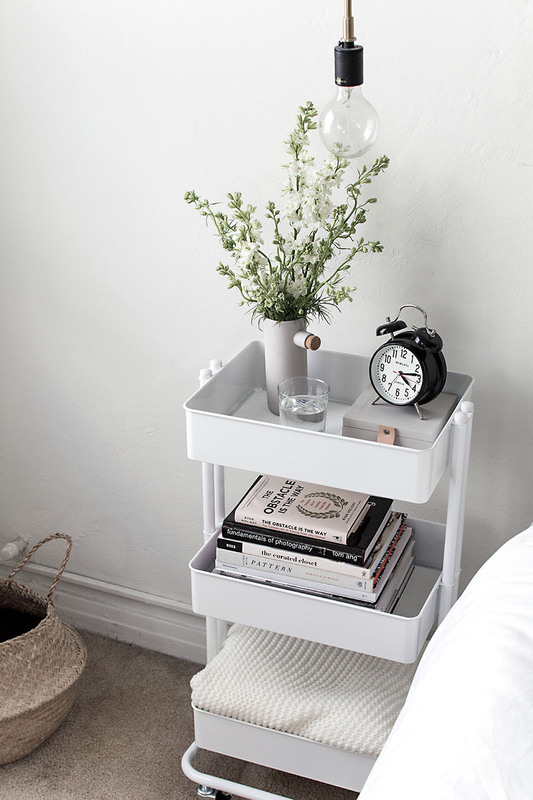 My bed has huge drawers underneath that I regularly use, so a cart as a night stand would actually be perfect! Thanks for the tip. Oo we should really take advantage of underneath the bed but we don’t… I actually haven’t looked under there in a while and I think it’s a wasteland under there haha thanks for the reminder. I use mine in the craft room to gather all the supplies I need for a project, from their usual storage places. Then I can roll it to wherever I want to work and keep it all together for the next day–if I’m not finished. Really like your cart and the ideas for it’s use. My bath is small and I have been looking for sooooooo long for something that is small and easy to move around. A must have! Now to Michaels to purchase. Hope they are not sold out. I love the cart for getting all items to make a recipe. 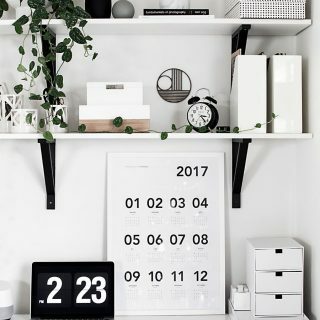 This way I can be more organized. My cart is black so easy to take care of. I picked mine up at Walmart. The wheels do come loss so have to be careful. Thanks for your ideas. Hi Audrey, I got the cart from Michaels. Where are the salt and pepper shakers from on the white cart? Hi Shayla! You can find them here. 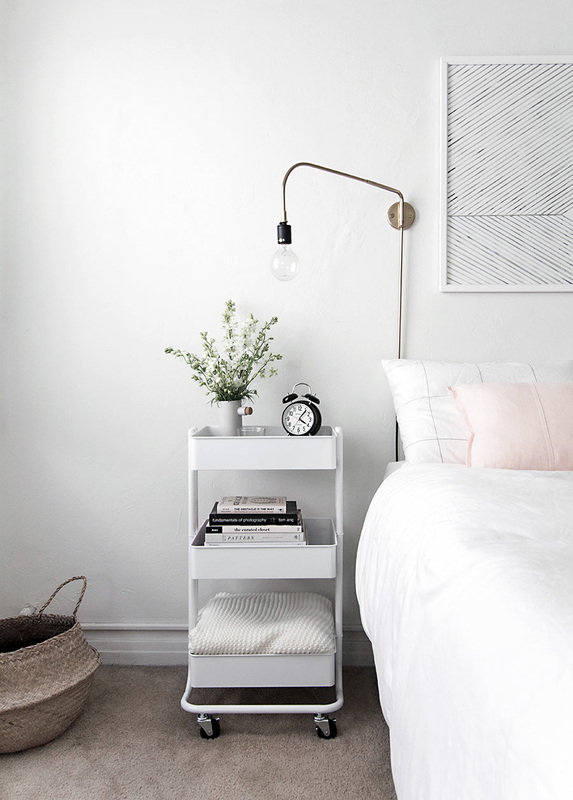 Hi Amy, would you be able to tell me where that wall light is from in thw first picture? Thank you! Hi Brig, you can find it here. There is also the three drawer cart from Walmart with wheels. I have one in closet that holds underware etc. One in bathroom for bath items. The drawers are handy to hide things put towels over it to protect it from dust. Keep them clean. Where can I purchase the white tea cart? No IKEA store close by. Hi Mary, the cart is from Michaels. Hi! It’s a DIY, you can find it here. I use mine in the bathroom to hold all my hair products (headbands, clips, combs, brushes, hair dryer, styling gels, water spritzer). Then I roll it back into a little closet away from sight. It’s great! You can find the white cart at SAMs. They are $39. They also have a couple of magnetic round storage containers you can use or remove. All the ideas are wonderful that everyone are using the for. I bought a black one at Ikea for my college daughter. She LOVES it. She uses for all her essentials. 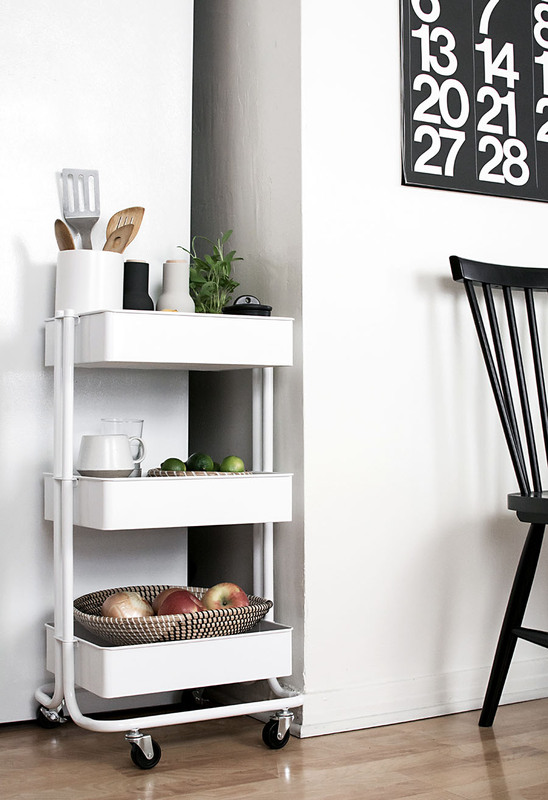 It’s perfect for those tiny dorm rooms that lack organizational space. I’ve loved it so much, I’m thinking about getting one for myself as well. Such wonderful ways you have used it for as well. Mine is a burnt orange from Ikea and I use mine as a cleaning cart. I keep all my cleaning supplies including a roll of paper towels. I just roll it between the kitchen and both bathrooms. It’ keeps under the sinks uncluttered and cuts down having to purchase multiple bottles of the same items. where did you get the container next to the jar? its so cute!!!! Hi! Unsure which container you’re referring to, can you be more specific? Rolling would come in handy if you’ve got a platform bed like we do, with drawers that can’t be accessed due to a side table. I like this idea, although I think I’d need a shorter cart due to the height of my bed.